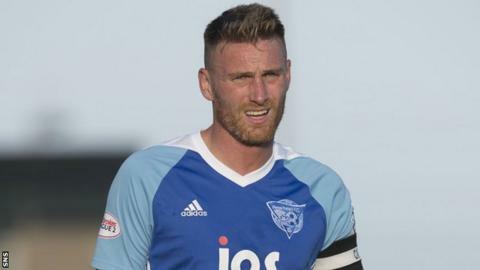 Peterhead's 1-0 win away to Stirling Albion keeps them within a point of league leaders Edinburgh City with a game in hand. City beat Cowdenbeath 2-0 in the capital, while third-placed Clyde were held to a 1-1 draw with Queen's Park. Annan Athletic are now six points clear in fourth after beating bottom side Albion Rovers. Berwick Rangers lost 3-0 at home to Elgin City - their sixth consecutive defeat. Craig Thomson and Blair Henderson scored first-half goals for Edinburgh before the Blue Brazil's hopes of a comeback were dented by David Cox's 69th-minute dismissal. Rory McAllister's 34th-minute header - the striker's 13th goal of the season - was enough to give Peterhead victory. Clyde lost pace despite former Scotland striker David Goodwillie giving them a lead late on at Hampden on his return from injury as that was soon cancelled out by Euan East. The Bully Wee are now five points behind Edinburgh, although they also have a game in hand and are now unbeaten in 14 games, after being held by a side who now have not won in 14 of their own. Annan, now unbeaten in five games, consigned Albion Rovers to a ninth consecutive defeat - the Coatbridge side are now without a win to 19 outings. Peter Watson, Tony Wallace and Steven Swinglehurst were on target in the first half to put Annan in control before Ross Fergusson wrapped it up late on. Elgin made it three wins a row with a win at Shielfield Park that leave their struggling hosts second bottom, seven points ahead of Albion Rovers. Robin Omar, Chris McLeish and Bryan Cameron found the net in the second half for the visitors.